Rachel Williamson is a CLS 4* rider and a USDF Bronze and Silver Medalist who is currently working on earning her USDF Gold Medal. Rachel is also participating in the USDF “L” judge’s education program. She has an M.A. in Education and taught previously at San Francisco State University. She has taken her passion for teaching and shifted focus to inspiring learning in horses and riders alike. Rachel’s early years with horses included a solid foundation in horsemanship through vaulting and three-day eventing in addition to dressage with Hermann Koopmans. 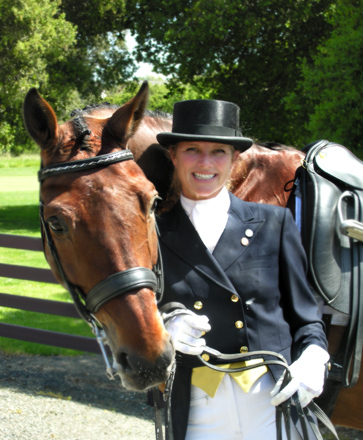 She has trained with Heidi Gaian and Pam Nelson of Villa Rosa Dressage for over 25 years. She worked at their farm, Villa Rosa, before becoming a professional rider and instructor. Heidi is a USDF Gold, SIlver, and Bronze Medalist, a USEF “S” Dressage Judge, and has successfully competed numerous horses at all levels including 7 Grand Prix horses. This multi-disciplinary background gave Rachel the fundamentals she needed to train her first horse Johannes up through the levels to earn her Bronze Medal. She enjoyed her first successes at the FEI levels and earned her Silver Medal aboard her horse Kristal, who she purchased from Villa Rosa in 2005. Beginning in 2012, Rachel trained and competed Larraine Beal’s Weltano, moving up the levels through Intermediare I. She currently trains and competes Markant van de Noeste Hoeve, also owned by Larraine Beal; Delamango, owned by Pam Nootbaar; and Fleur Rubin, owned by Annette Siegel. Besides competing in the saddle, Rachel has a strong record of helping her private clients reach success with their horses. Rachel is also involved with the Stanford Equestrian teams. She was instrumental in founding the Dressage team and coached them to two consecutive Regional Championships as well as appearances at IDA Nationals in 2012, 2013, and 2014. The team placed 12th in the U.S. in 2013 and 2014. She also helps coach the Hunt Seat team, which has had success at the IHSA Nationals for the last 12 years and placed 3rd in the nation at the 2018 IHSA National Finals. Believing strongly in continued learning, Rachel seeks to develop and improve her own skills through lessons and clinics. The information she learns not only improves her riding, but also augments her techniques for teaching her clients. She continues to train with Heidi Gaian regularly. Rachel also rides with Joh Hinnemann, Juan Matute, Corine Dorrepaal and Brian Hafner. She has been fortunate to have taken clinics with Debbie MacDonald, Laura Graves, Janet Foy, Shannon Peters, Dirk Glitz, Brian Sabo, and Francis Verbeek.